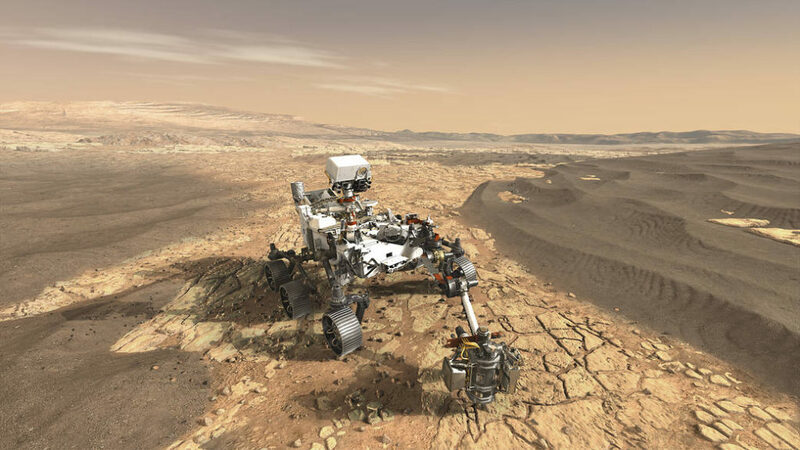 May 24, 2017 – NASA has released a new concept image depicting the Mars 2020 rover on the surface of Mars. The Mars 2020 rover mission is expected to launch in July/August 2020 aboard a United Launch Alliance (ULA) Atlas V 541 rocket from Space Launch Complex 41 at Cape Canaveral Air Force Station in Florida, and is targeted to arrive on Mars in February 2021. The mission is part of NASA’s Mars Exploration Program, a long-term effort of robotic exploration of the Red Planet. The Mars 2020 mission addresses high-priority science goals for Mars exploration, including key questions about the potential for life on Mars. The mission takes the next step by not only seeking signs of habitable conditions on Mars in the ancient past, but also searching for signs of past microbial life itself. The newest Mars rover introduces a drill that can collect core samples of interesting rocks and soils and set them aside in a “cache” on the surface of Mars. A future mission could potentially return these samples to Earth for scientists to study. In laboratories on Earth, specimens from Mars could be analyzed with equipment that can not be transported to Mars. The Mars 2020 mission will also provide an opportunity to gather knowledge and demonstrate technologies that address the challenges of future human expeditions to Mars. These include testing a method for producing oxygen from the Martian atmosphere, identifying other resources (such as subsurface water), improving landing techniques, and characterizing weather, dust, and other potential environmental conditions that could affect future astronauts living and working on Mars. The 2020 rover will look much like its six-wheeled, one-ton predecessor, Curiosity, but it will host an array of new science instruments and enhancements to explore Mars as never before. In addition to the caching system, Mars 2020 will provide new ways to analyze the chemical, mineral, physical and organic characteristics of Martian rocks. On the rover’s mast, two science instruments will provide high-resolution imaging and three types of spectroscopy for characterizing rocks and soil from a distance, also helping to determine which rock targets to explore up close. A suite of sensors on the mast and deck will monitor weather conditions and the dust environment, and a ground-penetrating radar will assess sub-surface geologic structure. The Mars 2020 rover will also use the same sky crane landing system as Curiosity, but has enhancements that will allow the rover to land in more challenging terrain. The mission adds new entry, descent, and landing (EDL) technologies, such as Terrain-Relative Navigation (TRN). Terrain-Relative Navigation allows the rover to detect and avoid hazardous terrain by diverting around it during its descent through the Martian atmosphere. The mission includes a suite of cameras and a microphone that will capture the never-before-seen or heard imagery and sounds of the entry, descent and landing sequence. Information from the descent cameras and microphone will provide valuable data to assist in planning future Mars landings, and make for thrilling video. Lockheed Martin is building the aeroshell system, a crucial piece of equipment that encapsulates and protects the spacecraft during its deep space cruise to Mars, and from the tremendous heat and friction that will be generated as the system descends through the Martian atmosphere. The aeroshell will be nearly identical to the one Lockheed built for Mars Science Laboratory and will be built at Lockheed’s Waterton facility near Littleton, Colorado. Louisville, Colorado’s, Sierra Nevada Corporation (SNC) Space Systems will design and manufacture the Descent Break Mechanism, which will control the speed of the tethered, car-sized rover as it gently lowers to the surface of Mars. SNC will also manufacture the actuators for the robotic arm and the caching system for the rock and soil samples.